HTML Map Designer Pro is an client-side and server-side Image Mapping Utility. Create HTML Image Maps of any shape in just a few clicks! Map Designer automates the creation of HTML Image Maps, making it easy for designers and Web developers to specify hot-links and clickable areas within images. HTML Map Designer Pro helps Web developers specify rectangular, round or arbitrary-shape areas in a what-you-see-is-what-you-get mode. Map Designer - Create HTML Image Maps of any shape in just a few clicks! 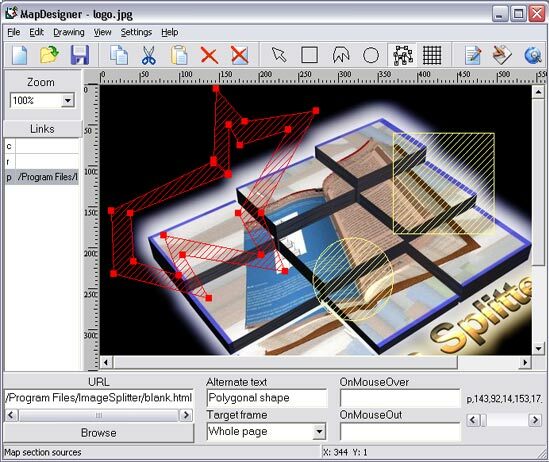 ...... HTML Map Designer Pro comes with a built-in visual HTML editor to edit the generated code if needed. Supports BMP, JPEG, GIF and PNG. Easy to use! Qweas is providing links to HTML Map Designer Pro 2.23 as a courtesy, and makes no representations regarding HTML Map Designer Pro or any other applications or any information related thereto. Any questions, complaints or claims regarding this application HTML Map Designer Pro 2.23 must be directed to the appropriate software vendor. You may click the publisher link of HTML Map Designer Pro on the top of this page to get more details about the vendor.